I haven’t disappeared completely, but I have been inactive and I’m terribly sorry. I’ve just been so busy at the moment – November was NaNoWriMo and this month I’ve been drowned by essays (honestly I’ve had four and then I’ve had to plan another and my coursework, on top of other homework) but I’ve got half of one left (which I’m putting off doing by writing this) and then my coursework plan (ditto) and then I’m done. Next week I should be able to read, write and plan / write blog posts (and take photos in this atrocious light), which will be great. I’m getting so many books for christmas / my birthday (the 29th – I cannot wait to be 18!) and I want to get my TBR down. I have set up an Instagram / bookstagram account for my blog which is @bookographic if you want to follow! I’m trying to do a couple of the challenges on there but they aren’t going so well due to lighting when I get back from school and the amount of essays I’ve had. I’m already planning my goals for next year in terms of my blogging, reading and writing, and I’m very excited. I’m also starting uni and I cannot wait. This year I aimed to reach a thousand total views on here by the end of the year and I’m on 1,200+ and I’m so grateful to everyone who has viewed / commented / liked / followed this. It means a huge amount. Anyway, I’m hoping to get back to the normal 2-3 posts a week schedule soon, once I have the time to sit and write reviews again (and actually read books so I can review them – 2 books last month was awful!) It may be January by the time that happens, but I’ll be writing them over the christmas holiday to at least cover January, if not part of February too! Last month was appalling in terms of reading, but I was doing NaNoWriMo so I feel that that’s a fair excuse! (I’m just going to keep telling myself that). I want to continue working on my novel throughout this month as I’d like the first draft finished before 2016, but it’s not going to be a priority in the same way that it was through November. I’m going to try to read more though this month as well, and I’m sure I can get some more read through the christmas holidays. A lot of these books I’ve started, many a while ago, so I would like to finish some of those off this month, but I’ll list those separately at the end I think as there are some books that I definitely want to read this month. Great Expectations – Charles Dickens. This one can fit into both lists, since I’m a third of the way through it and started it I think over a year ago (I put it down because I didn’t feel like reading a classic at the time, but I was really enjoying it). I just feel as though it’s the perfect novel for this time of year and I’m in the perfect mood to curl up with a classic like this. Let It Snow – John Green, Maureen Johnson and Lauren Myracle. I got this last year for christmas and I’ve had to wait a year to read it, as I didn’t realise it was actually a christmassy book, instead of a wintery one. (I’m that person who doesn’t do christmas at all (except buying a few presents) until the first of December). 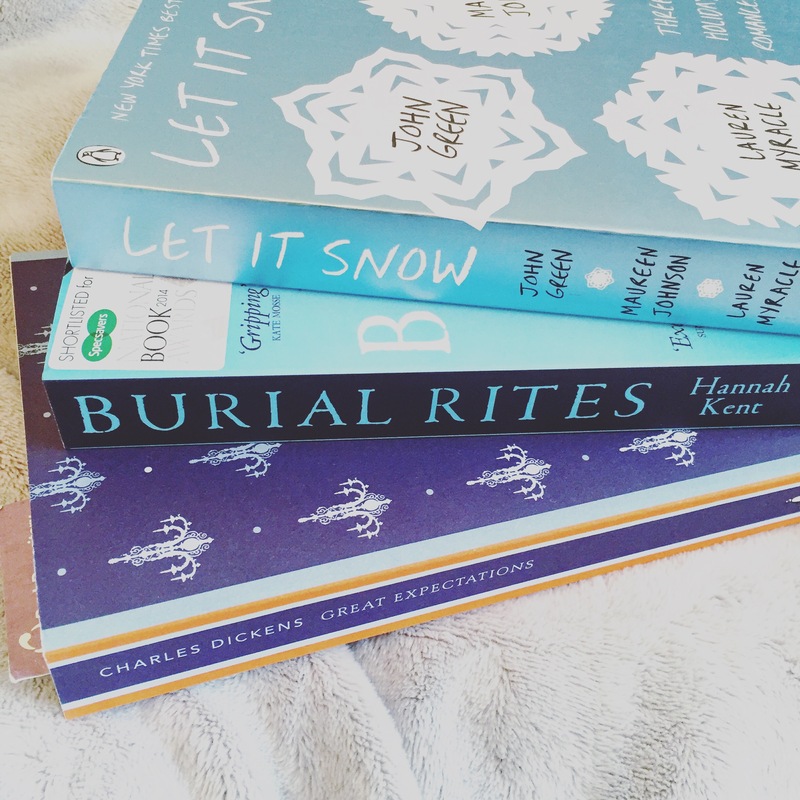 Burial Rights – Hannah Kent. Again, this just fits my mood and seems the kind of book to curl up with on a cold evening. It’s set in Iceland too and I fell in love with the place when I visited with school just over two years ago. Boy 23 – Jim Carrington. I don’t know if I’ll get to this, it depends how long it takes me to read Great Expectations, as that’s the first one I plan to read. This was out last month and I was supposed to read it in time, but NaNoWriMo meant I neglected it and I feel so bad for not getting to it soon enough. The Light That Gets Lost – Natasha Carthew. This is the same scenario as Boy 23, except that I did actually start it (but didn’t get far). Also I nearly fell into a reading slump and nothing could suit my mood except a fluffy romance so I picked up Lola and the Boy Next Door instead to prevent the dreaded reading slump. On Chesil Beach – Ian McEwan. This is so short I don’t know why I haven’t finished it. I will at some point though, because I’m enjoying it so far. Unflattening – Nick Sousanis. This is a review copy of a graphic novel, and I’ve been trying to read this for ages as it’s philosophy, which I like. I’ll tell you why I haven’t read it yet though, it’s because BlueFire Reader is awful but it’s the only app I can use to open the file. Honestly I have to re-download it each time because it won’t open and it takes so long to load each page I will read like five and then give up. The Picture of Dorian Gray – Oscar Wilde. Again, this just wasn’t suiting my mood at the time I started it. The writing style is absolutely stunning though, I just want to read it when I’m in the mood for it because I’ll enjoy it more. Rook – Shannon Cameron. I don’t know what it is with this book, it’s really good and I’m enjoying the story but I’m just not motivated to pick it up. The Children Act – Ian McEwan. To be fair, I’m about five pages into this one, so I can hardly say much about it. I picked it up and changed my mind. It wasn’t that it’s not good or anything, I just wasn’t in the mood for it (I’m very much a mood reader if you can’t tell!). On my Goodreads it’s under Currently Reading and so I want to get it read though, and get that number down. I currently have ten books marked as Currently Reading on Goodreads, the others are The Divine Comedy, which I want to take my time with (but it’s SO good), Les Miserables (which I have to take my time with because it’s so long) and A Midsummer Night’s Dream, which I’ll just pick up when I’m in the mood for it and probably finish it in one sitting! What do you want to read coming up to christmas? Are you a mood reader like I am and take several books before you find the one that you’re in the mood for or are you one of those lucky people who can pick up anything?